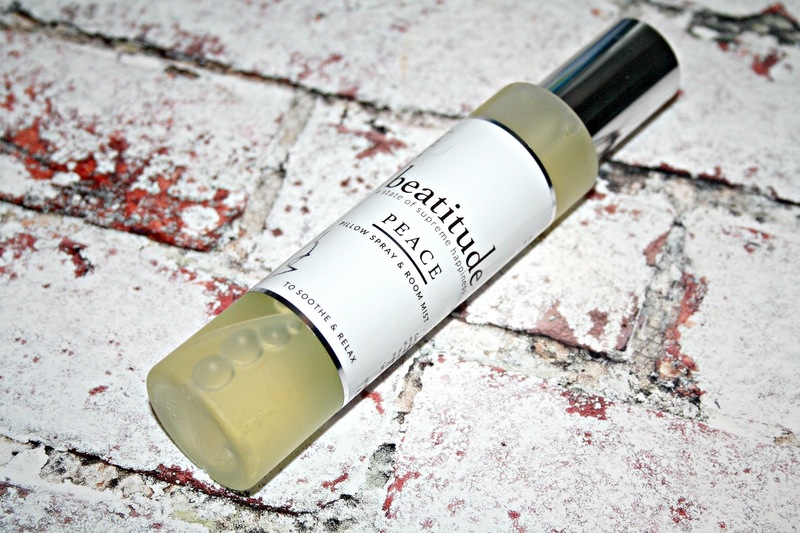 At the beginning of this year, I was introduced to beatitude, a brand which is best described as being is a luxury aromatherapy brand that has been created by beauty therapist and aromatherapist Rebecca O’Connor. Launched in Scotland in 2011 is 100% natural with no parabens, no petrochemicals, no sulphates and no artificial colours or fragrances. Beatitude is the ultimate feel-good brand and represents a luxurious high-quality product that has consideration for the environment. Having rather enjoyed using Patience bath oil (review here) I have kindly send Peace, a room and Pillow spray. 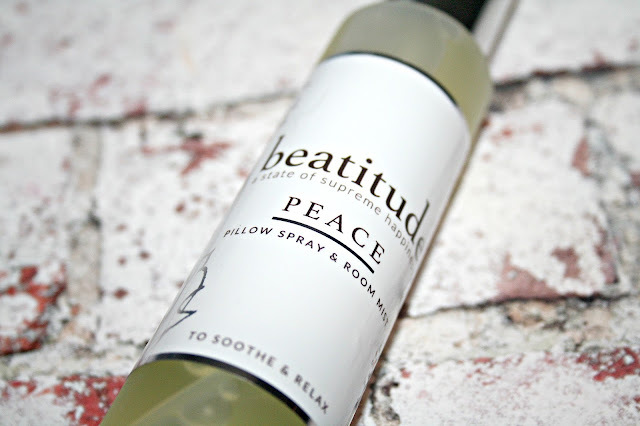 Scent yourself to sleep with our beautifully calming Peace Pillow Spray. Made with 7 pure essential oils that are renowned for their relaxing and soothing properties in a natural base of orange floral water this mist soothes stresses and assists a calmer state of mind allowing you to drift off to a good night's sleep. Again, essential oils fascinate me and I pretty much know what the properties are of most of the well-known ones and equally, I know which ones do and don't work for me. Within Peace you will find anxiety- reducing Lavender, calming Ylang Ylang, mind-clearing Frankincense and super- grounding Patchouli plus Mandarin which helps relieve stress, Cedarwood which is calming and relieving and Petitgrain which is said to be great for those with insomnia. All of these oils come together in a base of Orange Flower Water and as you can imagine it smells incredible. When it comes to using the spray, I tend to spritz it around my room and across my bedding half an hour before I am ready to get in to bed and by the time I am ready to get into my bed, the room not only smells incredible and it is great those times on insomnia, when you can't switch off and even when you are in one of those irritated moods. Priced at £24 for 100ml or £16 for 50ml you can find Peace and all other products within the beatitude range here. The blend of essential oils sounds really dreamy. I need to invest in some new room sprays and diffusers as I'm too scared to have candles on during the day as Penny is so active now. The scents in this sound lovely - I think I’d be spraying this a lot! I really like this product, it sounds great! room sprays always make your room a nice and cozy place to live and spend time. I love pillow sprays!And this one looks amazing! I'm also obsessed with Room Sprays! I will definitely add this in my collection. Great post. I am really into pillow sprays at the moment! Ooooh that sounds like such a beautiful blend! I love it. I really need this right now. I would definitely buy this product. Thank you for sharing. £24 for 100ml or £16 for 50ml, sounds like a great deal. Great post! Pillow sprays are my everything!!! I love this one too!! I'm all about pillow sprays, thanks for bringing this one to my attention! I love your post, dear. I'm a fan of pillow sprays too. Great share, thank you. I love the blend. This is definitely as must-have.